I think, most of K-Pop fans already known about this news event especially Malaysian ELFs. Oh, Yeah!! Super Junior member’s come to Malaysia again in 2014, after their concert Super Show 5 on 2013. 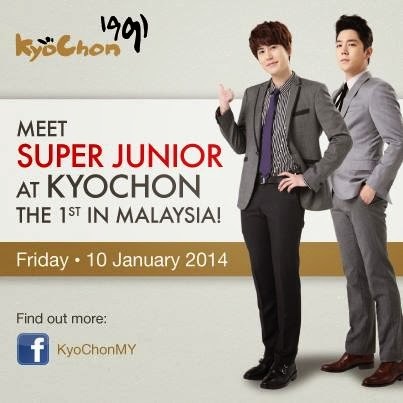 Now, KyoChon Restaurant is open at Kuala Lumpur, Malaysia on December 2013 but KyoChon will officially make opening event on 10th January 2014 (Friday) at LG311, Lower Ground Floor, New Wing, 1 Utama Shopping Mall. As you guys known, Super Junior is the ambassador of KyoChon Restaurant and two members’ of Super Junior (KyuHyun and KangIn) already confirm will come to Malaysia for opening event of KyoChon. Lucky for 50 fans that win the contest under KyoChon will be able to meet them for real and get Super Junior KyuHyun and KangIn autograph at KyoChon store on the spot. 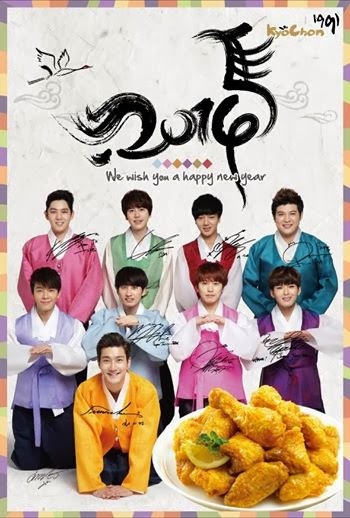 Their will autograph on KyoChon 2014 calendar only, so the lucky 50 fans must bring KyoChon 2014 calendar on this event. Super Junior Member’s wish Happy New Year 2014 to all ELF around the world.